“Christ the Comforter” is the stained glass window located above the altar in the Sanctuary. The window was donated by Mrs. Russell Van Kirk in memory of her husband, and was dedicated by Father Harry Hadley, first Rector of St. James Parish, during the 8:00 am celebration of the Holy Eucharist on May 16th 1948. The window, created by the Zettler Studios, features deep blues and reds as predominant colors. At the dedication, Father Hadley noted that the colors harmonize with the other sanctuary windows created by the same studio. The “other sanctuary windows” referred to during the above dedication subsequently were moved to other locations as a result of renovation projects in the church. 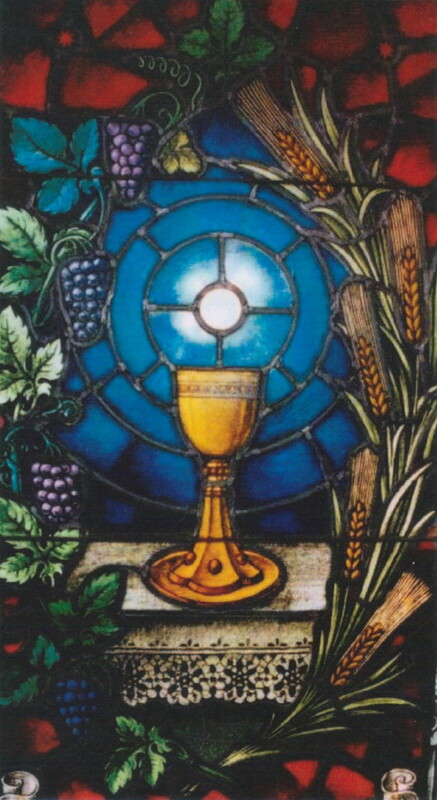 Those windows, the “Chalice and the Host” and the “Agnus Dei” were also created by the Zettler Studios and predate the “Christ the Comforter” window, based on statements made during the dedication. Very likely, these windows were also acquired during Father Hadley’s time (probably in the mid-1940s) since the St. James’ financial situation was poor in the mid-to-late 1930s and Zettler’s production facilities were destroyed during the war. All three stained glass windows are of the fused, painted glass type for which the Zettler Studios were famous. 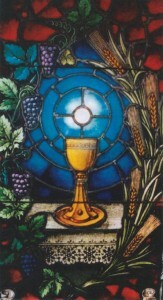 The “Chalice and the Host” window, was donated by Albert Kirms in memory of Henry M. Baylis. Mr. Baylis had served as Superintendent of the Sunday School, and was elected to the Mission Advisory Committee in November 1926, a position he held until his death in March 1930. Albert Kirms was a Commissioner and Mayor of Bradley Beach. In November 1948, Mr. Kirms served as the guest speaker for the Annual Corporate Communion Service, part of a nation-wide observance at which men and boys from across the USA received the sacrament. In November 1954, Mr. Kirms and other Bradley Beach Commissioners participated in the kick-off meeting for the fund raising drive held for the First Addition/Renovation to the church of St. James. The “Chalice and the Host” stained glass window is now located on the outside wall of the church, in the circumferential hallway, opposite the west entry to the Chancel. 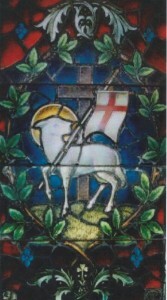 The “Agnus Dei” window was donated (donor unknown) in memory of Adelian Hale. This stained glass window is now located on the outside wall of church, in the circumferential hallway, opposite the east entry to the Chancel. The “Bethlehem” stained glass window was donated by Thomas Tuesday in memory of his father. Thomas Tuesday, from Ocean Grove, served as Secretary of the Mission Advisory Committee from March 1928 until December 1930. He was the first to use the title: Clerk of the Mission Advisory Committee. The “St. Luke” stained glass window was donated in memory of William Johnson by his wife, Sarah. The “St. James”stained glass window was donated in memory of Francis Maude Hale by W.J. and J.M. Hale. A traditional scallop shell can be seen adorning the cape of St. James. The“St. Paul” window was donated in memory of Thomas Moody. The “St. Andrew” stained glass window was donated in memory of John P. Van Kirk by his wife and son Russell. John Van Kirk, and his wife, were among the congregants involved in the establishment of the St. James Mission; both were very active members of the Mission for many years. Mr. and Mrs. Van Kirk also were members of the permanent building committee formed in 1915; Mr. Van Kirk served on the Mission Advisory Committee as Secretary in 1917, Treasurer from 1918 to 1926, and Warden from 1927 until his death in 1937. The final stained glass window on this side of Nave is “The Resurrection” which was donated in memory of Sarah Johnson, wife of man memorialized by the “St. Luke” stained glass window. The “St. Martha” stained glass window was donated in memory of Georgianna Tucker by Amy Atkins, who also donated the “Blessed Virgin Mary”stained glass window located on the East Side of the Nave. Both windows have intense red and blue colors. The “St. Peter” stained glass window was donated in memory of Charles H. Tucker, by his wife. The “Ascension” stained glass window was donated in memory of The Reverend Charles Holland Kidder D.D. who, although retired at the time and living in Asbury Park, actively supported the conduct of Episcopal religious services in Bradley Beach during the 1911 to 1914 period. Father Kidder also served as Priest-in-Charge during the first month after the official establishment of St. James Mission. In October 1916, Father Kidder assisted during the services held to commemorate the laying of the cornerstone for the new St. James Church. He also assisted the Priest-in-Charge when the Church was dedicated in January 1917. The “Good Shepherd” stained glass window was donated by the Church School in honor of Miss Fannie Jones, one of the four ladies who had organized the original Church School of the St. James Mission which first met, with fifteen scholars, each Sunday afternoon starting on October 11th 1914. 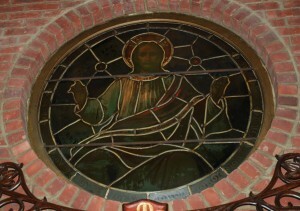 The stained glass window “Light of the World”was donated by Mrs. Charles Gillespie in memory of her husband. The stained glass window “Gethsemane” was donated by Mrs. George A. Smock in memory of her husband. Both Mrs. Smock and Mrs. Gillespie were active members of the St. James Guild, and frequently hosted meetings of the Guild. The “Jesus Friend of Children” stained glasswindow was donated in memory of Henry Kaftel by his wife. Mrs. Kaftel was also very active in the St. James Guild. The stained glass window entitled “Jesus Walking on the Sea” was donated in memory of George Canon Gordon by his Mother, Mary Gordon. These four stained glass windows, and the “Good Shepherd” window, all featuring scenes of Jesus, are beautifully designed and were most likely created by the same artist and studio based on their composition, depiction of the facial features of Jesus, and colors. After refurbishing the Narthex in1975, a decision was made that the massive oak front entrance doors should be replaced with doors that would enhance the beauty of the church entrance and also have a religious theme. 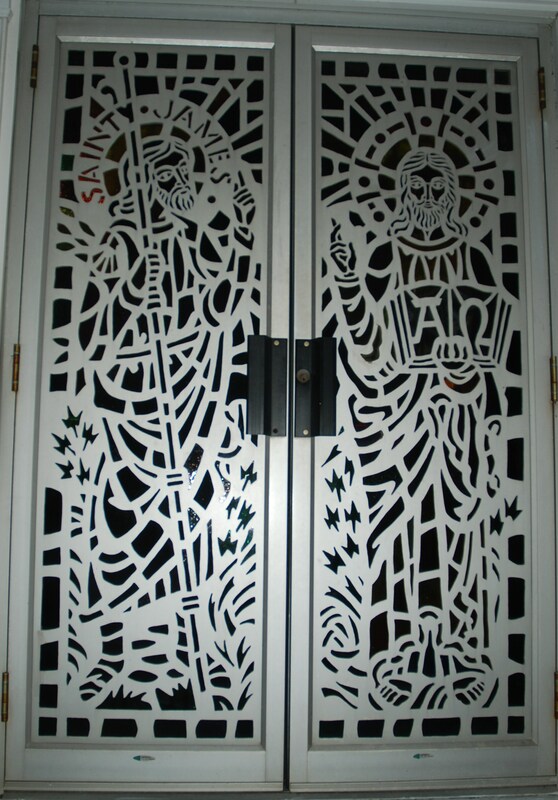 To that end, on January 10th 1976, the Rector, Father Alexy, initiated correspondence with the renowned Baut Studies of Swoyersville, PA concerning the design, fabrication, and installation of custom aluminum, Metal Art Stained Glass Doors for the main entrance to St. James Church. Within two weeks after announcing the Parish’s interest in acquiring the new entrance doors, the Vestry had secured sufficient funding, in pledges and cash, to proceed. The doors were designed, constructed, and installed in time to be blessed during a scheduled visitation by Bishop Albert W. Van Duzer, the eighth Bishop of New Jersey, on the Feast of Pentecost, June 6th 1976. 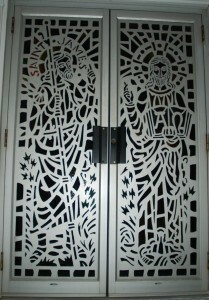 The pair of custom entrance doors, which feature a metal art process, developed by the Baut Studies, with mouth-blown antique stained glass inserts, depict Jesus Christ – The Alpha and Omega on the west entrance door and St James – the Apostle, on the east entrance door (the door also includes the words “St James”). In 1988, the doors were back-lighted to bring out the true beauty of the stained glass when viewed at night. The “River Jordan” stained glass window is most likely one of the original windows of the church. It too is of the fused, painted glass, type of stained glass window. The window is dedicated to the memory of Jeanette Johnson; the donor is unknown. The newest stained glass windows in St. James Church are also found in the Narthex. 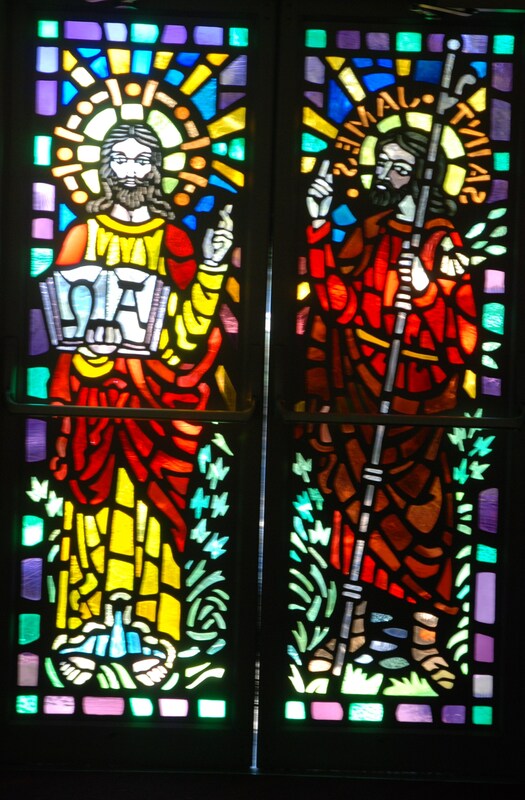 These two windows (created as a pair, and of fused, painted glass in type) were donated and installed in 1988. 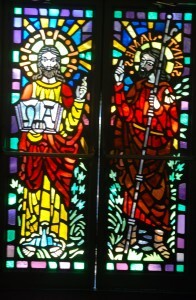 The first of these windows, entitled “Jesus Caring for the Children” is dedicated in memory of Charles H. Weaver; it was donated by his family. The second of these windows, entitled “Birth of Jesus” is dedicated in memory of Edith A. Savoth; it was donated by her children. Due to Father Hadley’s close association with the Patrolmen’s Benevolent Association, and his service as Chaplain for the Bradley Beach Chapter (PBA Local 50), it is appropriate that a stained glass window, given in memory of deceased members of PBA Local 50, be one of the stained glass windows located in the Rector’s sacristy. The two stained glass windows of the Rector’s Sacristy have been renovated, reframed, and protected by a storm window. The windows are common in design, and constructed using leaded, colored glass. The window entitled “Lamp Symbolizing the Word of God” was donated by Mabel Burke in December 1955. The second window, also donated in December 1955, “Symbol for St. Michael, the Archangel” was donated by PBA Local 50 of Bradley Beach in honor of their deceased members. The outside wall of the Altar Guild Sacristy has one of the older stained glass windows in the Church; actually, it is a two section, fused painted glass window entitled “Christ Blessing Little Children.” The window has been reframed and protected by installation of a storm window. 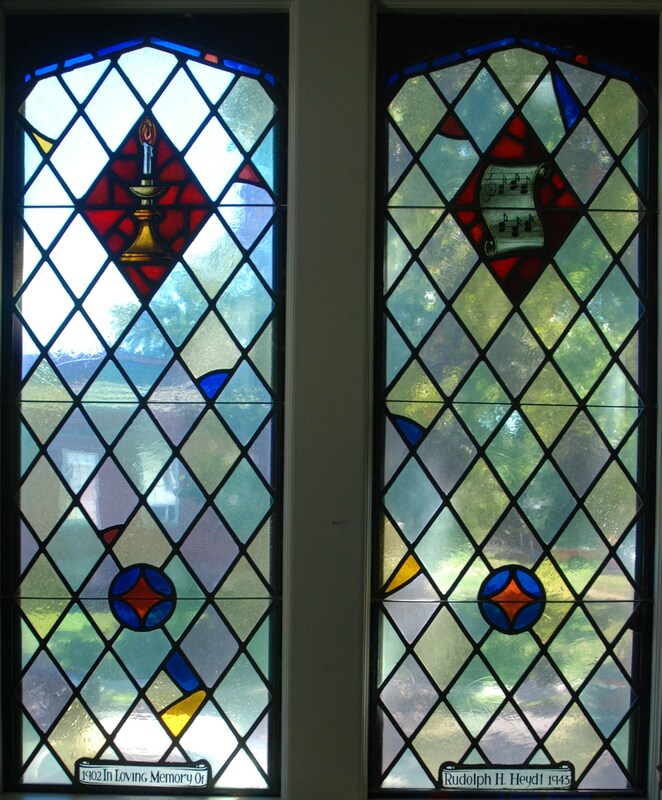 The pair of windows is dedicated to the memory of MaryJane Louise Bostick; they were donated by Mr. and Mrs. L.J. Farry, Mr. and Mrs. G.T. Bostick, and the St. James Women’s Club. The Choir Rehearsal Room includes two single stained glass windows and one double stained glass window – all of matching design. The first single stained glass window, “Witnessing for Christ,” is donated in memory of PFC Fred Ward (1919-1944) by his wife Betty and son Robert (who has served as a Vestryman and currently serves as Chalice Bearer; and, when a youngster served as an acolyte at St. James Church). PFC Fred Ward was a member of the 10th Infantry Regiment of the 5th Infantry Division assigned to the U.S. Third Army; he was Killed-in-Action on September 11th 1944, during combat associated with a Moselle River Crossing, and was awarded the Purple Heart. His organization, the 10th Infantry Regiment, earned the French Croix de Guerre, with Palm, from the French Government for actions surrounding that important river crossing. The Croix de Guerre (“Cross of War”) is a military decoration, awarded by France, to units or individuals who distinguished themselves by acts of heroism involving combat with enemy forces. The second single stained glass window is dedicated to the memory of Anna Gabla (1880-1952). The double stained glass window, “Let Your Light shine and Music Scroll,” is dedicated to the memory of Rudolph H. Heydt (1902-1943). It is believed that he too was killed in action during World War II in mid-late October of 1943 since altar flowers were donated, annually at that time, in his memory by Mrs. Heydt. Their sons, John and Robert, were acolytes and members of the Boys Choir. With the possible exception of the window dedicated to the memory of Anna Gabla, these memorial windows were included in the 1955 Dedication Ceremony for the First Addition to the church. However, in 1955, these windows (the single window in memory of PFC Fred Ward and the double window in memory of Rudolph H. Heydt) were originally located in the Acolyte’s Room.